Canoeing Ireland is scheduling a Level 5 Instructor Assimilation weekend on the 5 & 6 March 2016 in Galway for River and Sea Kayakers. The below post gives a full break down of the Level 5 Instructor development process and how the assimilation pathway was agreed. Active Level 5 Skills Panel Members automatically meet the assimilation requirements and are invited to apply for the assimilation weekend by filling out a course application form and submitting it to training@canoe.ie. Anyone who does not automatically meet the active Level 5 panel requirements can make a written application to tdu@canoe.ie to be considered for assimilation by demonstrating that they meet the Level 5 Instructor competencies required for the holistic development of paddlers from entry to Level 5 Skills standard to exit of the Level 5 Skills standard. In early 2014 the TDU established a Level 5 Instructor Development Panel which was made up of the TDU chairperson and experienced Level 5 Skills panel members and individuals who had completed the recent BCU Level 5 Coach Training. The group corresponded by email for several months before holding a meeting and workshop in Coaching Ireland Offices on the 21st February 2014. Following the February meeting a large amount of work was put in by the meeting attendants to develop a thorough, holistic and comprehensive Level 5 Instructor Training Course. In summer 2014 a course was agreed and course facilitators were identified. The first Level 5 Instructor course was advertised on 13 October 2014 to start on the 22nd November 2014 and finish in May 2015. Unfortunately only 4 students signed up for the course and it had to be cancelled. Only 1 member of the existing Level 5 skills panels signed up for the course and there was little committed interest shown by the broader body of Level 4 Instructors and Level 5 Skills Panel Members. In December 2014 the Training and Development Unit and the Level 5 Instructor Development Panel agreed to take another look at the Level 5 Instructor programme with some fresh eyes and put together a Training Advisory Panel (TAP) to analyse the recently developed Level 5 Instructorship scheme with an aim to engage with more Level 4 Instructors and the members of the Level 5 Skills Panels. The TAP carried most of its discussions on line through email communications and held a meeting in Sport HQ in Dublin on Tuesday the 23rd June 2015 to draft a proposal for the Training and Development Unit which is outlined below. There ar e existing Level 5 Instructors on the Canoeing Ireland database. The current Level 5 Instructors were qualified in two ways. Most of the existing Level 5 Instructors migrated from the old cohort of senior instructors when the new award scheme was introduced in 1998. The remaining Level 5 Instructors completed the BCU Level 5 Coach award and applied for equivalence with Canoeing Ireland. The BCU Level 5 Coach award has since been discontinued. Canoeing Ireland has compiled a list of all Level 5 Skills Training Courses run between 2008 & 2015 and assessments run between 1998 & 2015. Training records from 2008 onwards are accurate however there are no records of the training courses that occurred between 1998 and 2008. One assessor can be identified for all assessments from 1998-2008 however in many cases the 2nd assessor is unknown. A summary of the activity log for each panel member was produced. With the exception of one Level 5 Instructor, the database records indicate that none of the Level 5 Instructors who migrated from the senior instructor qualification in 1998 have been involved in the assessment of Level 5 Skills awards since 1998. In any case the level of activity of the migrated Level 5 Instructors at the upper end of the award scheme has been very limited since 1998. The number of people applying for the Level 5 Instructor qualification will be significant in the short term but small in the long term. There are currently 78 Level 4 Kayak Instructors and 17 Level 4 Sea Kayak Instructors. We can estimate that approximately 50% of existing Level 4 instructors may be interested in applying for the Level 5 Instructorship creating an initial demand of 39 people in river kayaking and 9 people in sea kayaking over the next 2-3 years. However to take a look at the Level 5 Skills Assessment numbers gives an indication of the long term demand for such an award. In the last 17 years, since 1998, an average of 4 people a year have completed Level 5 River Skills Assessments. The highest frequency of assessments was between 2008 & 2011 where 24 people completed assessments, an average of 8 people per year over 3 years. The average for Level 5 Sea Skills Assessments is significantly lower with an average of less than 1 person a year completing assessment. There have been no Level 5 Canoe Skills Assessments run in Ireland since 1998. The TAP has analysed the existing Level 5 Instructor training proposal. The existing proposal is thorough and extensive however its failure to engage the existing Level 5 Skills Panel members is noteworthy and should be addressed. The Level 5 Skills Panel members represent the most experienced instructors in Ireland. The active members of the Level 5 Skills Panel operate to a standard which is comparable to the BCU Level 5 Coach standard. This is exemplified by the demand for Canoeing Ireland instructors at the Cranafest Weekend and Northern Ireland Paddlefest as well as feedback from Level 5 Skills course participants who have completed courses with BCU coaches. It would be difficult to establish a credible Level 5 Instructor Award in Ireland without engagement from the instructors who currently run the Level 5 Skills Awards. Without engagement from the active Level 5 Skills Panel members there is a risk the award would become a title with no clout or remit. Are we going about developing the Level 5 Instructorship in the wrong way? Are we being too modest about the abilities of active Level 5 Skills Panel Members? Do we have instructors in Ireland who already have the Level 5 Instructor competencies? Are we making people jump through a training hoop, just to see them jump through the hoop? In trying to compensate for the lack of an award are we trying to take on too much in one go? Should we assimilate suitable candidates to Level 5 Instructorship? In which case what defines a Level 5 Instructor, or what is a Level 5 Instructor capable of? Should we allow Level 4 Instructors go for direct assessment at Level 5 Instructor Assessment? In which case what is a Level 5 Instructor Assessment? The TAP developed a simple generic definition for the Level 4 and Level 5 Instructorship, focusing on the difference between the two awards. The Level 4 Instructor works on the holistic development of paddlers from entry to Level 4 Skills standard to entry to Level 5 Skills standard in a suitable environment. Level 5 Instructor works on the holistic development of paddlers from entry to Level 5 Skills standard to the exit of the Level 5 Skills standard in a suitable environment. After deliberation via email the TAP proposes an alternative phased development process for the Level 5 Instructorship. Phase 1 Assimilation of active Level 5 Panel Members. Phase 2 Invitation to direct assessment for inactive Level 5 Panel Members and active Level 4 Instructors. Phase 3 Development of training pathway by Level 5 Instructors for Level 4 Instructors who wish to become Level 5 Instructors. When the Level 4 Instructorship was introduced, around 2000, Canoeing Ireland started by assimilating people who held a Level 5 Skills and a Level 3 Instructorship. Around 2006 we introduced the Level 4 Instructor assessment, allowing candidates to go for direct assessment. In 2013 we developed a training course to support short falls we saw in the candidates coming for assessment. The Level 4 Instructorship is now a well-established and respected award by the national and international paddling community which up and coming participants are enthused and motivated to complete. It is proposed that we should implement a similar staged process with the Level 5 Instructorship as we did with the Level 4. In order to establish a Level 5 Instructor award it is necessary to recognise individuals in the Irish paddling community who may already meet the required competencies of the award. In this case the competencies required for the holistic development of paddlers from entry to Level 5 Skills standard to exit of the Level 5 Skills standard. Individuals who have proven experience demonstrating these competencies should be invited to apply for assimilation to the Level 5 Instructor qualification. In order to be assimilated candidates can prove successful application of the required competencies through delivery of Level 5 Skills training courses and assessments in the past. This by default requires applicants to be members of the Level 5 skills training and assessment panels. Assimilation of members of the Level 5 Skills Panels does not change their qualifications or remit, but recognises their existing qualifications, to deliver and assess Level 5 Skills, under a different title; the Level 5 Instructorship. It is important that the assimilation criteria be transparent and fair. In order to facilitate this the TAP recommends that anybody who has been involved in the delivery of two or more training courses or assessments be invited to apply for assimilation. In order to maintain transparency any Level 4 Instructor can apply for Level 5 Instructor assimilation. They must however prove that they meet the Level 5 Instructor competencies required for the holistic development of paddlers from entry to Level 5 Skills standard to exit of the Level 5 Skills standard in order to be considered for Level 5 Instructor assimilation. It is proposed to run the assimilation over one weekend on the 5 & 6 March 2016 on a section of the Galway Coast for the Sea Kayakers and on the Boluisce at the entry rapid to top drop and the slalom course below top drop for River Kayakers. This would take advantage of the Water Release for Galway Fest. Note that both these sections are above the Galway Fest race course. Day 1 will be a peer coaching day. Assimilation candidates will coach each other, in groups of 4. The peer coaching session will focus on observation, analysis and feedback of high level skills and tactical performance in challenging environments as well as safety & rescue practices in the environment. Candidates at this standard should be able to demonstrate a deep and modern understanding of paddling skills, safety & rescue protocol and be capable of maximising the available environment to generate learning outcomes for even the most experienced paddlers, in this case their peer Level 5 Skills Panel Members. This workshop will provide opportunity for debate on modern and advanced boat handling skills & tactics as well as pedagogical philosophy, best practice in safety & rescue and feedback methodologies. In the evening a thorough review of Day 1 will be based in a lecture facility in Spiddal or Galway, with both Sea Kayakers & River Paddlers together. The outcomes and debates of the day will be explored to agree on the frontiers of best practice. Day 2 will be run with pairs of instructors delivering to live groups of candidates on the same stretches of water to apply the learnings of Day 1 with live participants. This will give instructors an opportunity to test new ideas and philosophies with peer partners and to monitor and observe results in real live candidates. In the afternoon a peer debrief session will be run in pairs whereby assimilation candidates provide each other with written and verbal feedback with improvement goals to implement. The weekend will wrap up with a full group debrief of the weekend and an online feedback follow up which will explore some concepts for the future training course and direct assessment. On Day 1 each assimilation candidate will be asked to write up an anonymous peer review crib sheet and recommendation for two members of their group. On Day 2 groups will be mixed and each assimilation candidate will be asked to write up a peer review crib sheet and recommendation for their partner. This will produce 3 individual reviews for each participant. Following the assimilation the reviews and recommendations will be checked by the TDU who will then confirm assimilation for each candidate or recommend further steps to assimilation or direct assessment. Phase 1 will establish a base of experienced Level 5 instructors at the highest level of the Canoeing Ireland award scheme. These people will be the active panel members at level 5 skills training and/or assessment. The next step in the proposed process is to open invitations to active level 4 instructors. Inactive Level 5 Skills panel members who wish to go for assessment to be recognised as a level 5 instructor would be automatically eligible for assessment at this level. Active level 4 instructors would be required to highlight their experience and suitability to be allowed go forward for direct assessment by mapping their experience to date against the level 5 instructor competencies showing how they have operated in appropriate conditions and environments instructing, coaching and leading groups. The direct assessment will require candidates to deliver a two day Level 5 Skills Training course to a group of 4 potential students in a suitable environment. The course will not be recognised as an official level 5 skills training and therefor can be delivered in a broader spectrum of water levels and locations. The candidate will be required to present a clear lesson plan with relevant learning outcomes. 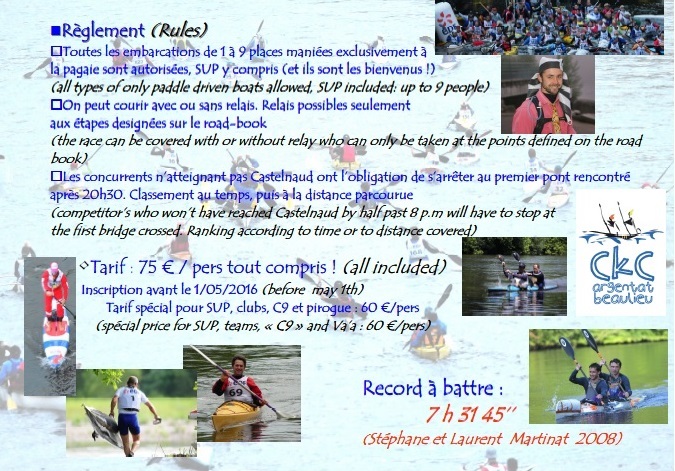 The candidate’s performance will be judged on their ability to run a safe and engaging course that meets the predetermined learning outcomes and to provide the candidates with effective individualised coaching and feedback in their paddling skills and tactics as well as their safety and rescue abilities. The candidate will also be required to inform the participants where their skills lie in relation to the Level 5 Skills Assessment standard. Upon completion of the direct assessment candidates would be recognised as level 5 instructors by Canoeing Ireland. The Level 5 Instructors who were assimilated in phase 1 will form the initial Level 5 Instructor Assessment Panel. Phase 1 and 2 allow Canoeing Ireland to establish a working Level 5 Instructor Award in the short term using the experience of long established level 4 instructors to replace the training requirements for the award. Phase 3 is a long term objective which will ensure the continued success and improvement of the award into the future. A large amount of work was completed in 2014 on the design of a Level 5 Instructor Training Course, which should form the foundations of the final award. The assimilation and direct assessment processes of phase 1 & 2 will inform the TDU of weaknesses in the instructor training system which can be addressed in the new Level 5 Instructor Training programme. Following the implementation of phase 1 and phase 2 an online survey should be completed of all Level 5 and Level 4 Instructors to explore and identify the needs and wants of the upcoming cohort of Instructors as well as training time frames and costs which they consider acceptable. This information can then be used to calibrate the proposed training programme and enhance it to suit the requirements of the body of potential level 5 instructors. The present vision (mid 2015) is for a 2 to 4 day training course with a consolidation period to include (but not limited to) coaching a peer candidate for a number of sessions and assisting on level 5 training courses and assessments. More may come of this from the assimilation weekend of phase 1 through practical demonstrations of skills and discussion on same. The level 5 instructorship is the final missing link in the Canoeing Ireland award scheme. The Canoeing Ireland instructor scheme has been streamlined to reflect an instructorship for each participant skills award level. As it stands we now have a respective instructorship for every skills award up to Level 4. Furthermore Canoeing Ireland is one of the most successful NGB in the Coaching Ireland Adventure Sports Framework with praise for the Canoeing Ireland quality assurance practices and recognition of the award scheme up to the Level 4 Instructorship in River and Level 3 instructorships in Sea and Canoe. The establishment of a Level 5 Instructor will be a ground breaking development not just for Canoeing Ireland but for Irish adventure sports as it will require a new level to be developed in the Adventure Sports Framework. This final step in completing our award scheme starts with the 3 phases outlined above. The proposed 3 phase process has been agreed with Coaching Ireland and endorsed by the Canoeing Ireland Training and Development Unit. Please see below dates for our Children’s Officer Workshop and Designated Liaison Person Workshop. For registration forms please contact me on the below details. Please be advised booking is essential. Phase 2 of Database is Live!! The Slalom Committee is happy to announce that the 2015 Annual General Meeting of Canoe Slalom Ireland will take place at 4pm on Sunday the 20th of December 2015 at the Canoeing Ireland training centre in the Strawberry beds. Proposals for the AGM should be submitted to the Slalom Committee, at this email address, at least 7 days in advance of the General Meeting, i.e., by Sunday the 13th of December. All members of the Irish Canoe Union will be entitled to vote at the AGM, including Junior paddlers over the age of 18 on the 1st of Jan of the year of the General Meeting. The Committee looks forward to seeing you at the meeting. The River Liffey is exceptionally high today. 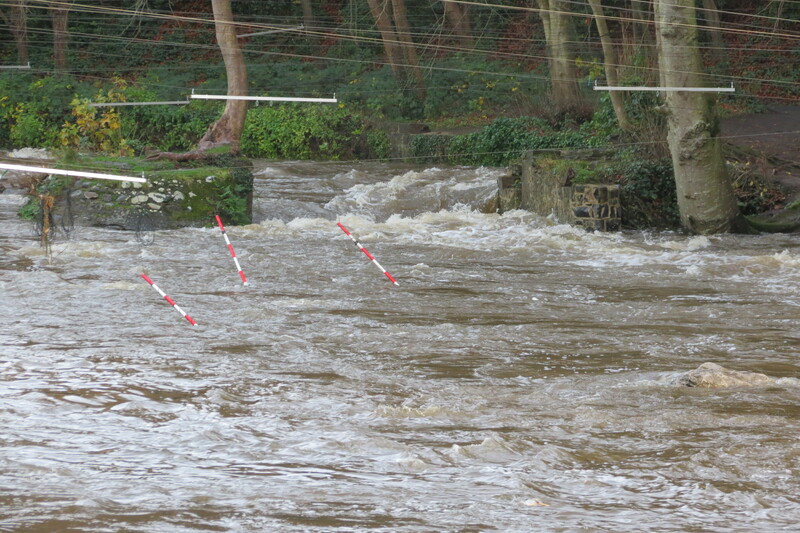 We are advising paddlers to stay away from the sluice this weekend as the flood waters have brought the river within a couple of metres of slalom lines. 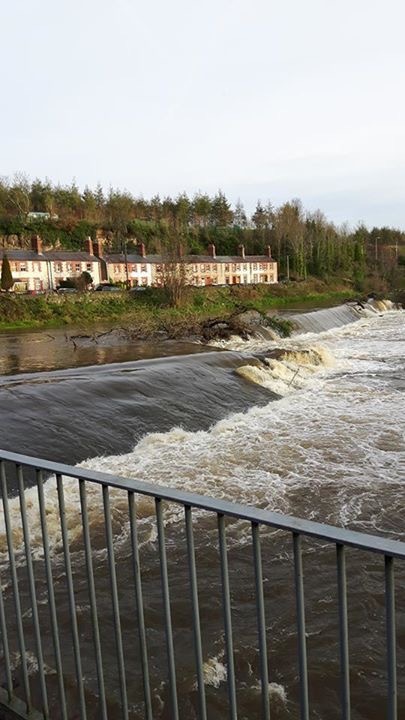 There also reports of a tree on Lucan weir. Many rivers around the country will be in flood this weekend making some weirs and rapids hazardous. Remember to make good decisions and stay safe folks! Please find attached list of dates for Code of Ethics – Basic Awareness Course for 2016. Can you please circulate this to all clubs? Please note the change of the date for May.